NYPost: Howard Stern To Replace Jimmy Fallon? 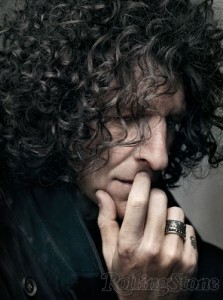 You probably wake up to Howard Stern — but do you want to go to sleep with him, too? Over the weekend, word broke that Jay Leno is being pushed out to make room for the younger Jimmy Fallon — but sources close to the radio man tell The Post that Stern, in turn, is being “groomed” by NBC as the new Fallon. Sure, Stern loves the judging gig on “America’s Got Talent,” but even Piers Morgan and Sharon Osbourne could take just so much of extreme cyclists and dog acts. I never figured it was really about that for Stern — it was about creating a Howard that was palatable for TV. Howard has been trying to show TV suits for years that he’s the whole package — as opposed to the one he talks about on the radio. He’s shown — on “AGT,” one of the most popular family shows on TV — that he can act like a grown-up and play well with others, if the money’s right. And, according to a source who knows him well, the suits at NBC have gotten the message. But why, then, would NBC hire a guy — Stern — who is not only just three years younger than Leno but is too old in TV years to even appeal to himself? So now that he’s acceptable for prime time, is he ready for late night? “I always say that to him! He is one of the best interviewers out there,” Beth said. So can she talk him into trying his hand at staying up late? “I am going to!” she said. Howard deserves the spot and would be great at it. Fallon is not edgy and never takes a chance with anything. Howard takes chances and those chances he takes pay off in a big way. Howard has something that cannot be bought or learned and that is having both a unique voice and the voice of a working class man. Even though his income does not allow him to claim to be part of that class anymore he still understands the concerns and attitudes of the working class. And his empathy is not an affectation it is real and it is insightful and humorous. His interviewing skills are unparalleled and top notch. I would love to be able to interview stern. He is a most fascinating individual. I would love to have the opportunity to write for him someday. If anyone out there reads this, please drop me a line. Be well and have a great weekend. e.e.